"Friend of Ivana Milkovic told me about humanitarian campaign KAS. There are two reasons why I was immediately delighted with this campaign: I lived and worked in South Africa and saw the poverty in which a large number of children live. 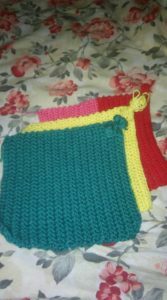 Another reason is the benefit of crocheting and knitting for each individual. When these two things join, manual work and humanitarian action, fulfillment and good sense are guaranteed. The KAS action was launched in 2008 so this year it celebrates 10 years of humanitarian action. 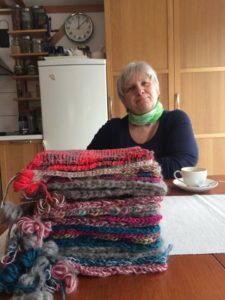 Knit a Square Croatia we founded Ivana Milkovic and I in 2018 and the number involved in the action is growing rapidly! The objective of the humanitarian campaign KAS is knitting or crochet squares that are connected in blankets, making a cap and a heater for your hands, all to abandoned children that are mostly already born with virosome HIV orgnula, felt the warmth and care to them all together, each we are expressing with a square. Number of HIV infected children growing daily, gives rise to them are more than 500 a day just in South Africa. If we look beyond, to the entire Southern Africa and the rest of the world, the figure reaches 15 million HIV infected and usually abandoned children. These numbers can be frightening and thought to that as individuals we can not do anything. On the contrary! Every single box is important, each cap and heater knobs. The squares are made around the world. There are many corporations that animated their employees, various associations that bring together different kinds of interests, retirement homes, rehabilitation centers, schools, kindergartens. All make sense in this ideal combination of humanitarian work and personal well-being. The squares are made of any kind of warm yarn, any stitch, any thickness. I collect them at the end of each month and send in South Africa. There are women combine for a symbolic fee, so that the benefit of expanding into other layers of society. The square is of the size 20x20cm with a thread of 50cm left for the connection, and the deck consists of 35 pieces. Ideal hats are those that are made with stretched pattern. So the cap grows with the baby.. The greatest joy for children is toys, so we receive hand-made toys, as well as donations of all other kinds of toys. (When I say toys, I mean all kinds of "teddy bears"). We also receive cash donations. Money is primarily used for shipping to JAR, and possibly for wool shopping. Join facebook group Knit a Square Croatia, share your thoughts, ideas, and experiences with group members. In the file group, you will find a variety of auxiliary materials, details about the campaign, instructions for various types of crocheted and knitted squares, hats, toys. Lots of informations you can find on global KAS webpage. Welcome to Knit a Square! "